Sails Main, genoa, new MPS. Furling main and furling headsail. Centre cockpit cruising yacht designed by Alan Wright, built 1985 in GRP by Craddock. Very roomy interior, excellent galley, large aft cabin, 6'3" headroom, gas califont. Furling main and furling headsail, new MPS, spinnaker with sock and pole. New dodger, 27hp Bukh aux on saildrive. Electronics include VHF, log/speedo, wind speed, autopilot, GPS, chartplotter, depthsounder, TV and stereo. 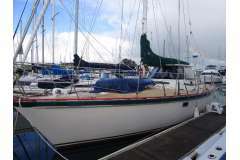 A very nice cruiser, excellent live-aboard, priced to sell.